I've shared a beautiful find in Luberon that made me dream of traveling to Provence again. While not cheap, that house was not on the expensive side either so I wanted to see just how good the more expensive rentals would be. Quick sort from high to low stars with some $12,000/night.. yes, per night but except the gardens I cannot say I was mesmerized by most of these more expensive places as I was with that Luberon country house. After going down the list I found a nice house - more expensive at $2,400 per night but with amazing views. 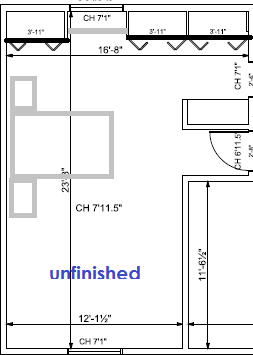 I am so in love with my new bed that I am doing a reveal #2, and #3 as well. I knew there was a reason I was buying all of that bedding over the years. In fact, the styling is very similar as all of the major components are the same - pictures, lamps, nightstands, rug and, of course, the bed. 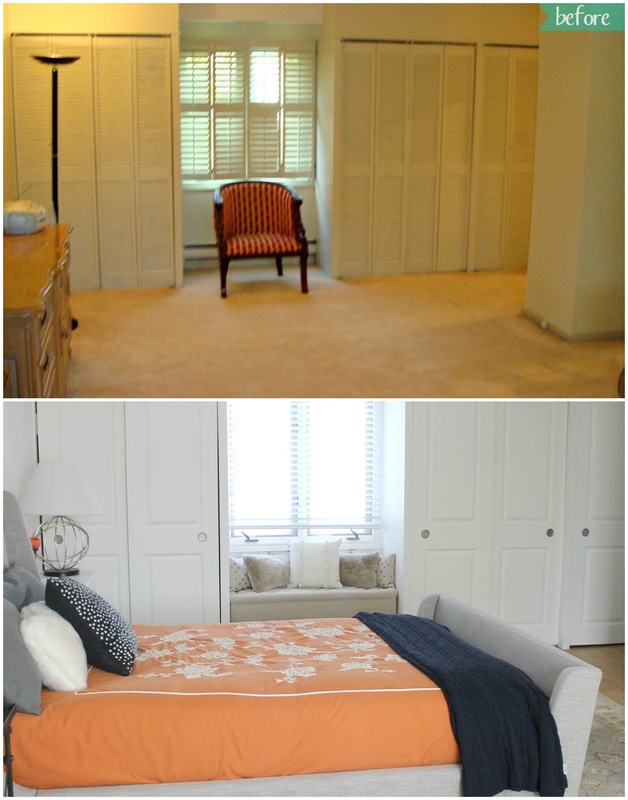 In reveal #3 there are a few bigger changes, but this time around, difference is really only in bedding and pillows. Even though I love these Visual Comfort lamps, I wanted to make them even better for this room by changing the shades to black drum shades. 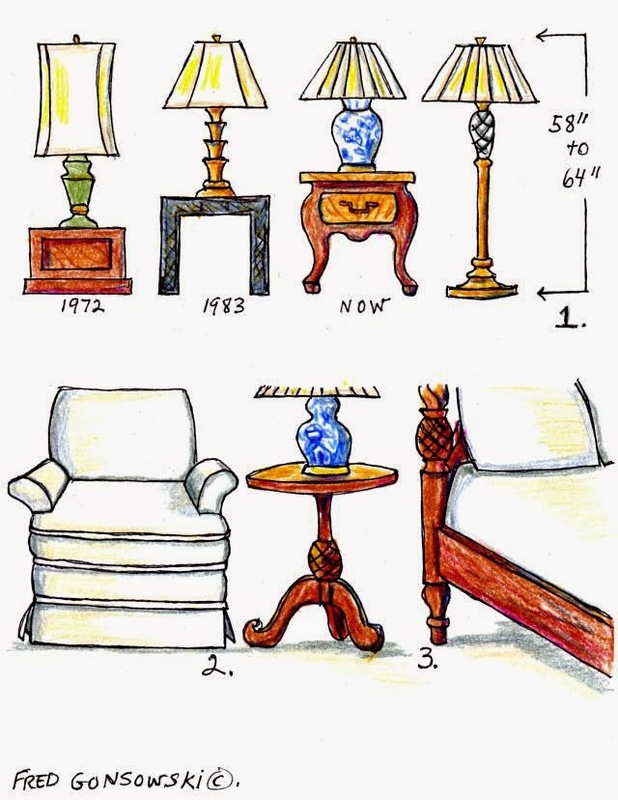 The issue with this plan is that there is no real standard when it comes to how shades and lamp bases are connected. I found this out hard way when I brought over linen shade from a trip to France. Luckily, Pottery Barn Kids had lamp bases that worked with it so I was able to make do. Other option was Ikea, but then, one does not want to always have lamps like everyone else. In the case of these shades, I thought Ikea would be an answer only to find that only black drum shades they had are, in fact, discontinued and could not find any in store.. Not a great trip to Ikea especially as people ignore family designated parking - yes, talking to you blondie! - so I had to park elsewhere only to find another car so close to me that I could not open the door to put baby in the car seat at the back... anyway.. off topic..
Other option is Target as they have shades that would visually work - and their system is similar to what I am looking for except that they made their opening slightly smaller - so it would not fit... Yup, I am still on the lookout. Spring barely arrived (it will be freezing temperature again tomorrow) and yet I am thinking of summer and beaches. Last year in May we went to Mayan Riviera for two weeks - amazing trip, so relaxing for all of us and two years ago we spent about 3 weeks on Adriatic coast continuing with our European travel that lasted some two and half months over summer. There is a significant photo dump from the coast so I've decided to split the post in two parts. I also just realized that I completely missed posting about Germany (I remember preparing the post but can't find it published...) so I'll get to that as well. Let's start things off with some beautiful scenery... This is called Bay of Kotor (or Boka Kotorska locally) in Montenegro and it consists of four gulfs: gulf of Herceg Novi, gulf of Tivat, gulf of Risan, and gulf of Kotor. 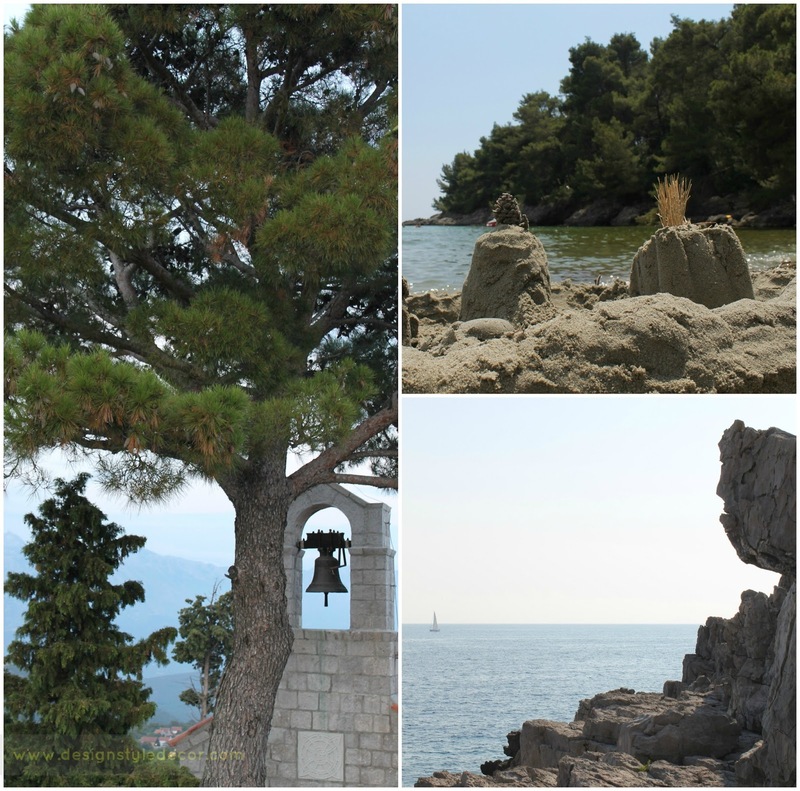 We had a chance to spend time around all of them during three weeks and to do a day trip to Dubrovnik, Croatia. 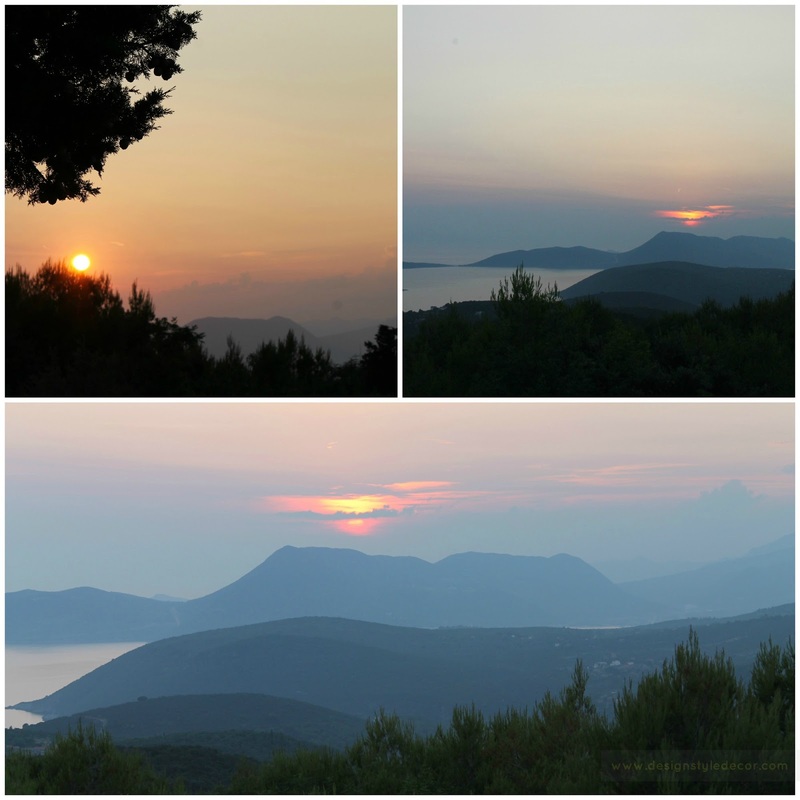 Specifically, these images are of Lustica Bay. For first two weeks we ended up renting a house with two bedrooms which we found through some friends, kitchen was on a separate floor and very large terrace overlooking the sea on the second one. Accommodation itself was nothing special to report (i.e. no photos) but having a large terrace was great and views were wonderful. Distance from the beach was 5 minutes walk albeit it was quite steep but we did not overly mind it. We would spend time on the beach in the morning and afternoon avoiding it during lunch hour mostly to avoid the sun and to eat at the house. When we had a car we did some day trips to other beaches in the area or other little towns. First image here is of the beach where we were, second is view from the terrace, third is my artistic daughter playing with clothesline pins and taking photos of them. During some of these day trips we would venture out to secluded beaches with beautiful and pristine water, water pools and wonderful views. 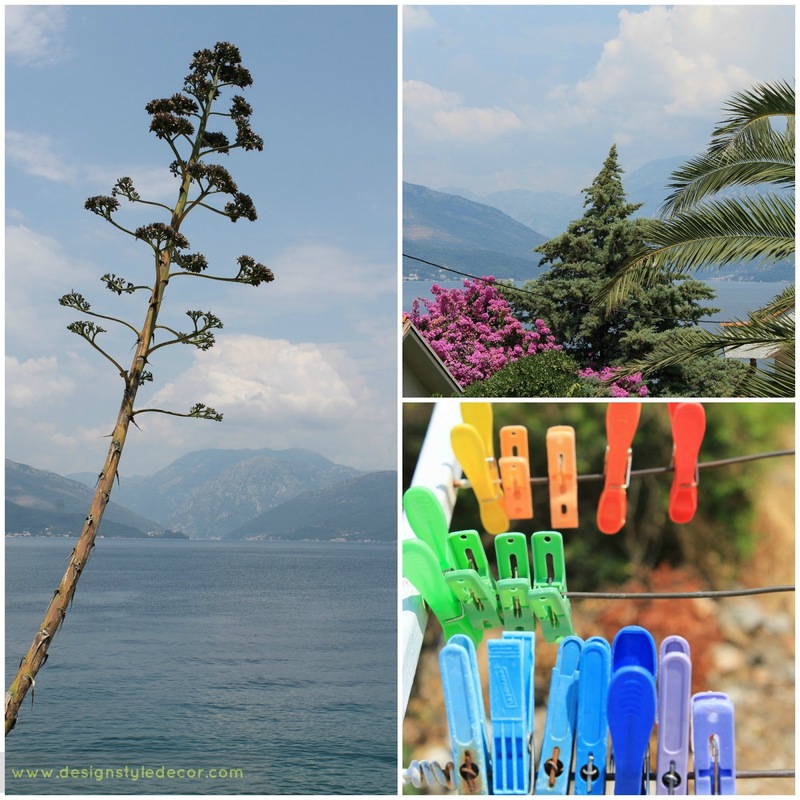 The Adriatic is a part of the Mediterranean Sea. The name Adriatic is of an Etruscan origin and was called Hardriatic according to their colony of Hadria. 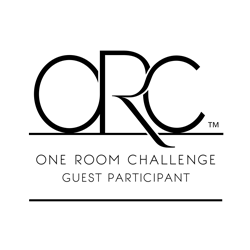 Later, the name of Adria started to be extended, whereas the name Adria is used today in many languages, for example in Italian or German language. It is lying between the Italian and Balkan peninsulas. It runs along the coasts of various countries. 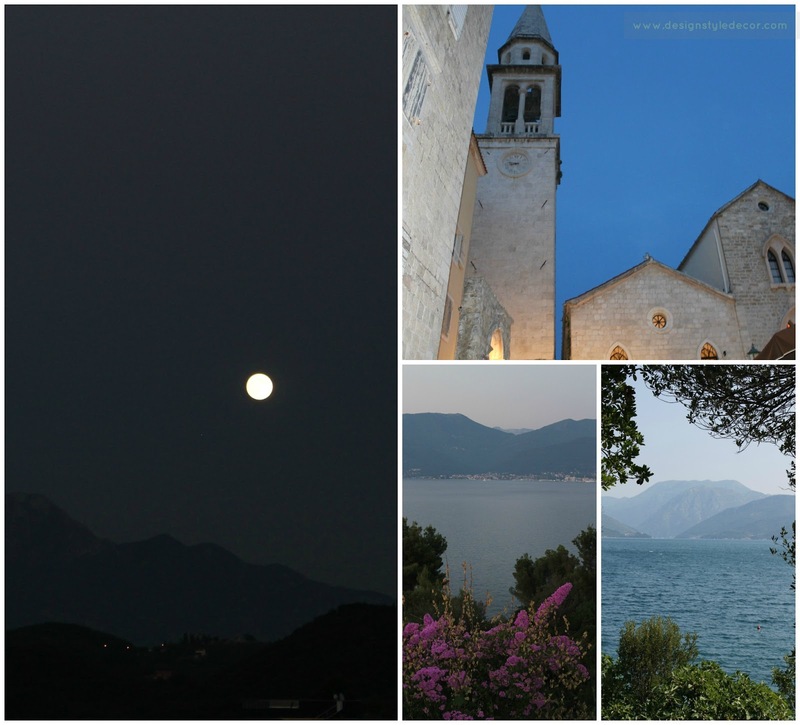 In the west, it is the coast of Italia, in the east the coast of Slovenia, Croatia, Bosna and Herzegovina, Montenegro and Albania. The eastern coast is extending from Gulf of Trieste in the north and in the south is leading into Otrant Lowland. The western shore of the Adriatic Sea (the Italian) has less broken relief, does not have the islands and its inland is covered by lowlands. The eastern shore (the Croatian) has a broken relief, there are many islands in a great part of the shore, almost along all the longitude. It has a broken relief. 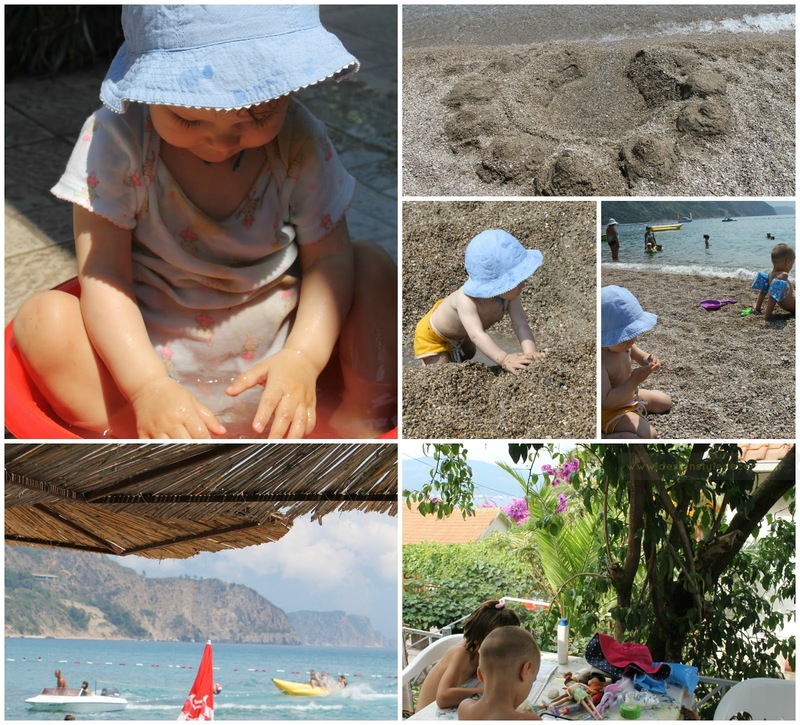 There are three different types of beaches here - rugged rocks which work great with older kids who want to jump into the water, small stones (pebbles), and sand. I like all of them and there are pros and cons to them all - so we just went about and alternated spots giving kids more options. Little E has just turned 1 when we made this trip, so I was a bit worried about how she will take it all and how she would do with different kind of beaches. She was great - everything was a different adventure. Older kids were happy as well - they had company (other kids to play with) and while they were not too happy to do homework (yes, I am terrible!) in the afternoons, they did it in the shade enjoying smells of the sea. 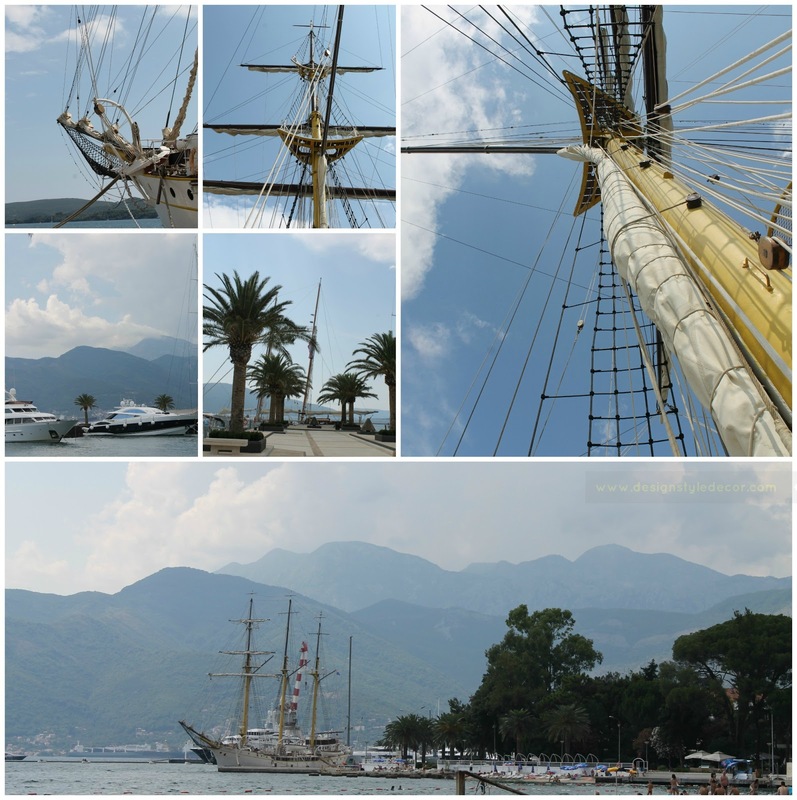 One of the trips was to Tivat where we climbed onto training ship "Jadran" built 1930s and Porto Montenegro. 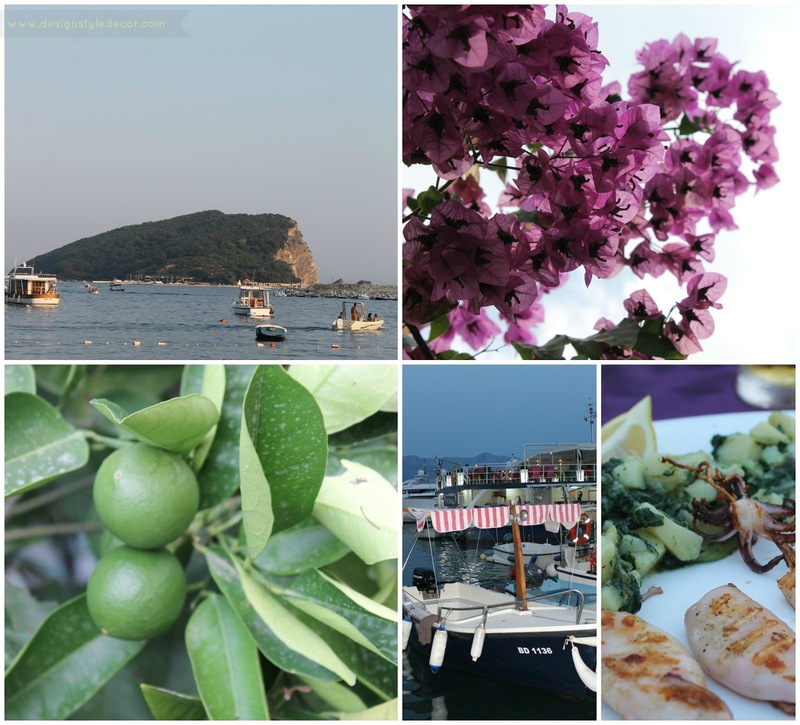 We also visited Budva , enjoyed a stroll, nice dinner and lovely sights. 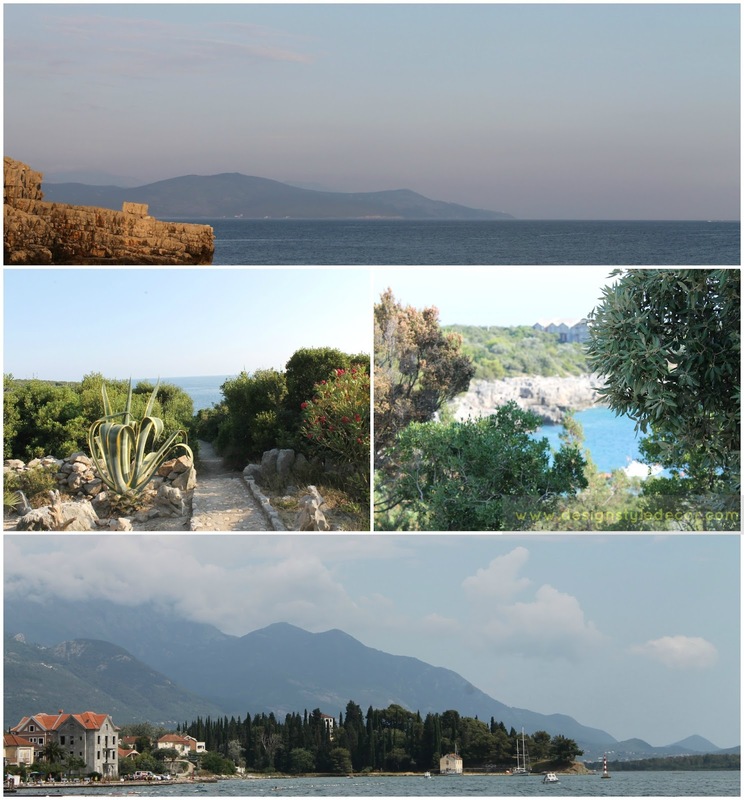 Budva is #1 destination in Montenegro according to TripAdvisor. 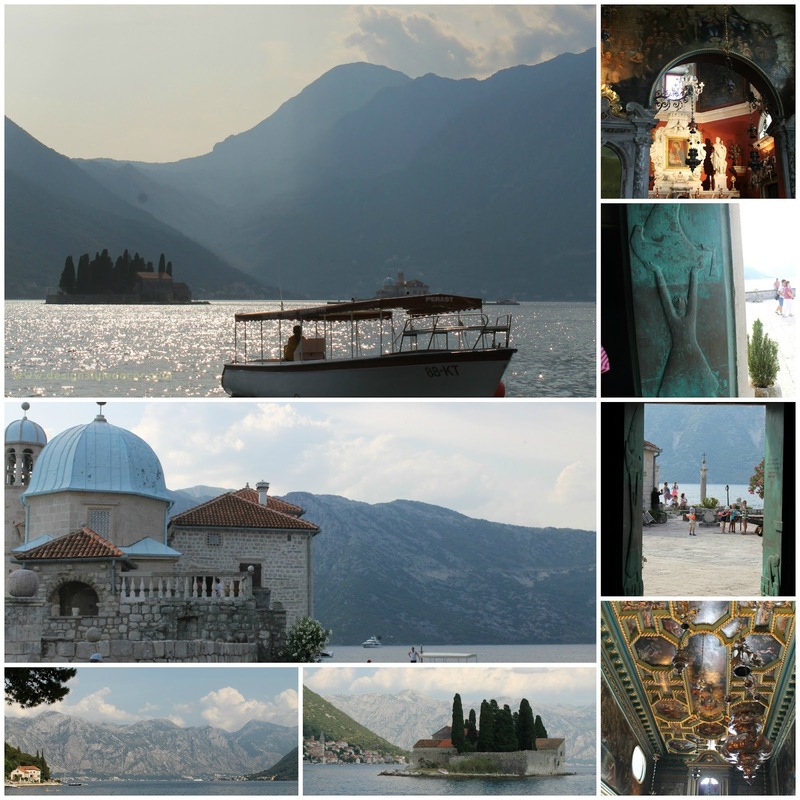 One of the small trips was to Perast, a well preserved village,a UNESCO World Natural and Historical Heritage Site. 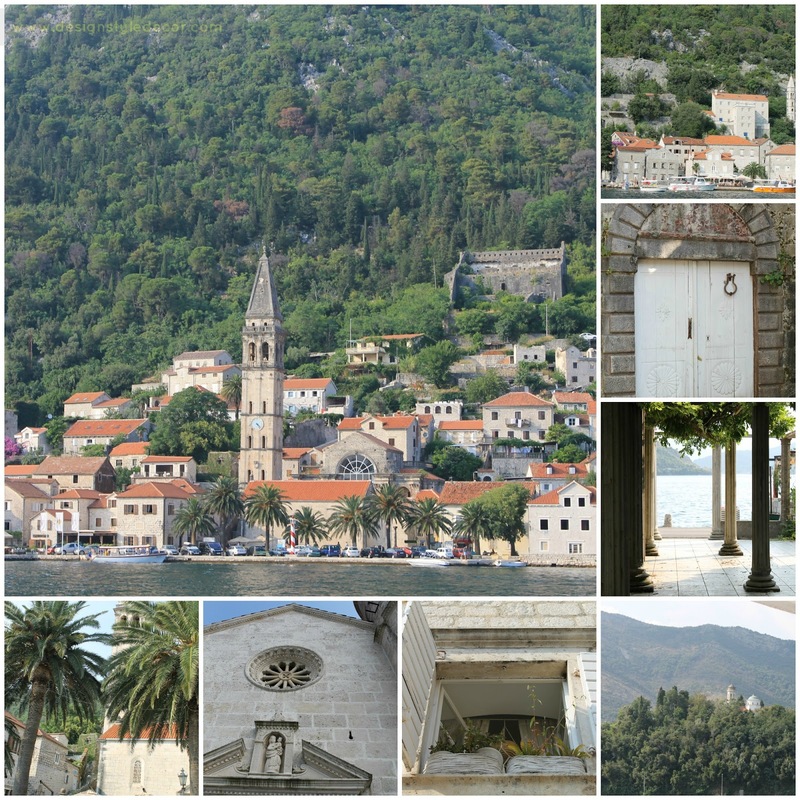 Across from Perast is Gospa od Skrpjela (in translation "The Church of Our Lady of the Rock"), small island with beautiful church. According to legend, the islet was made over the centuries by local seamen who kept an ancient oath after finding the icon of Madonna and Child on the rock in the sea on July 22, 1452. Upon returning from each successful voyage, they laid a rock in the Bay. Over time, the islet gradually emerged from the sea. The custom of throwing rocks into the sea is alive even nowadays. Every year on the sunset of July 22, an event called fašinada in the local dialect, when local residents take their boats and throw rocks into the sea, widening the surface of the island, takes place. 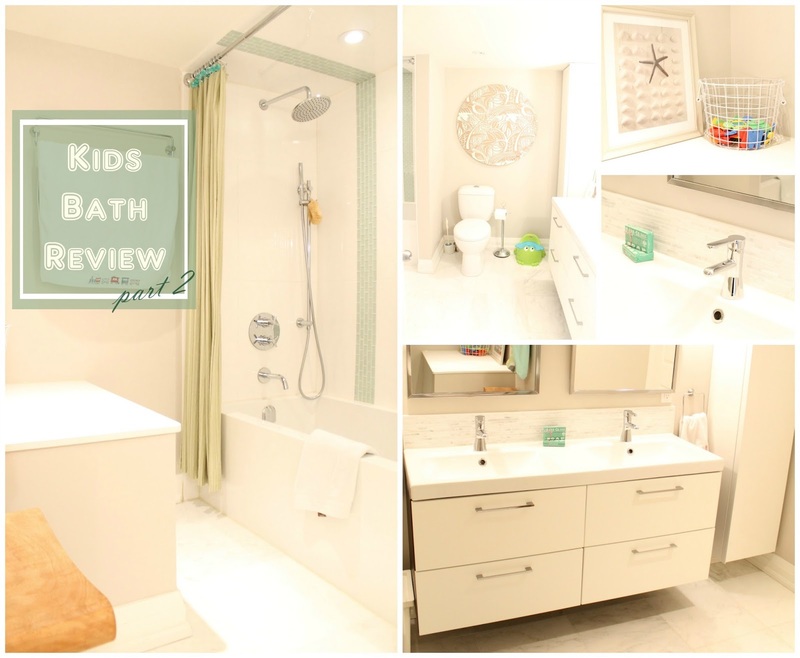 I've shared the first part of the review of our kids bathroom, two years since we completely renovated it here. In this post, I will share how the rest fared with regular use and abuse of our 3 kiddos and a baby. I guess that most of the people feel like they don't have enough storage no matter how much more storage they create. That is not true in our case. Perhaps we don't stock enough stuff as I am finding that I cannot fill drawers and shelves in this bathroom. 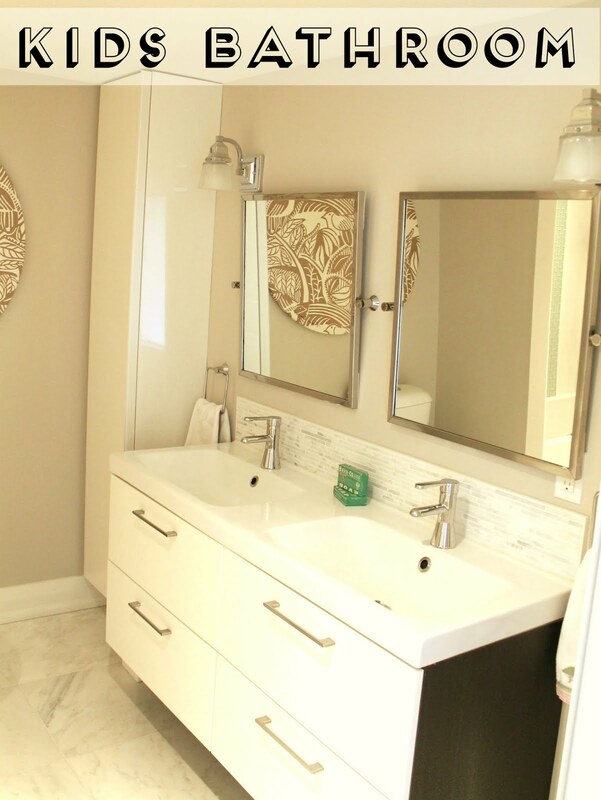 I am sure that this will change as the kids get older and enter their teenage years, but for now having a deep vanity with 4 drawers and two high cabinets provides ample storage especially as we keep most of the towels outside this bathroom. Given how happy I am with storage we have I had to give this category the highest rating. 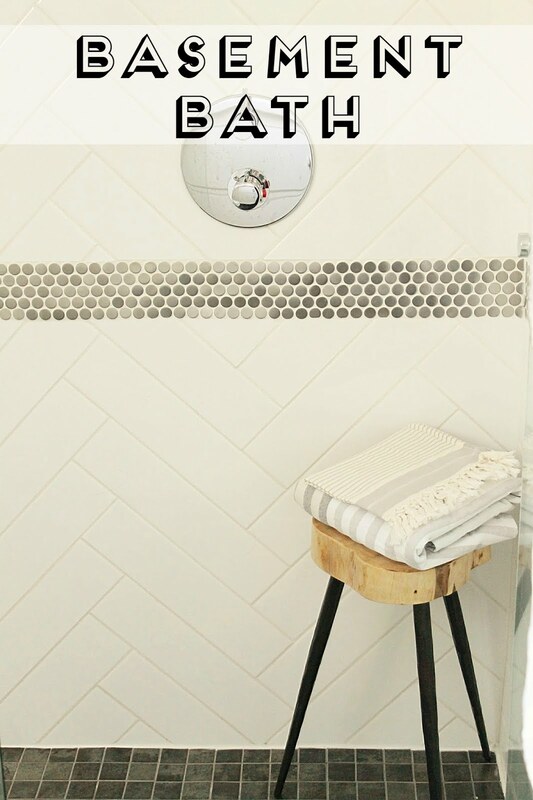 I've shared a post on how we selected our shower systems for our multiple bathroom renovations. 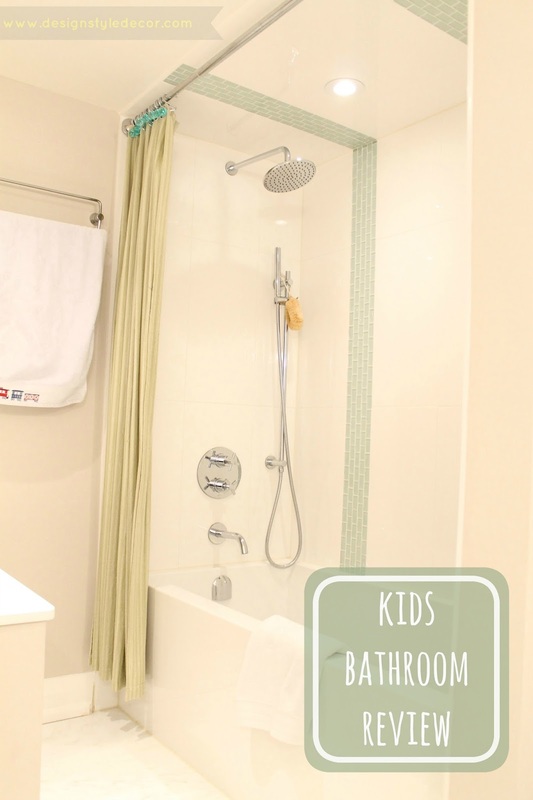 Shower system in our kids bathroom is from Rona's Uberhaus collection, no plastic components and it has a handheld part - a must for kids' bathtub. When the system was first installed, we could not get cold water going, just warm and hot. We were at the point of going to Rona to discuss the issue, but suddenly, it just started working. Now - it could be that we did not how to use those knobs properly (not likely), or that something just clicked. In any case, overall we are very happy with this system - it looks great, no plastic parts, all is very sturdy, and except initial problem, it is performing really well. 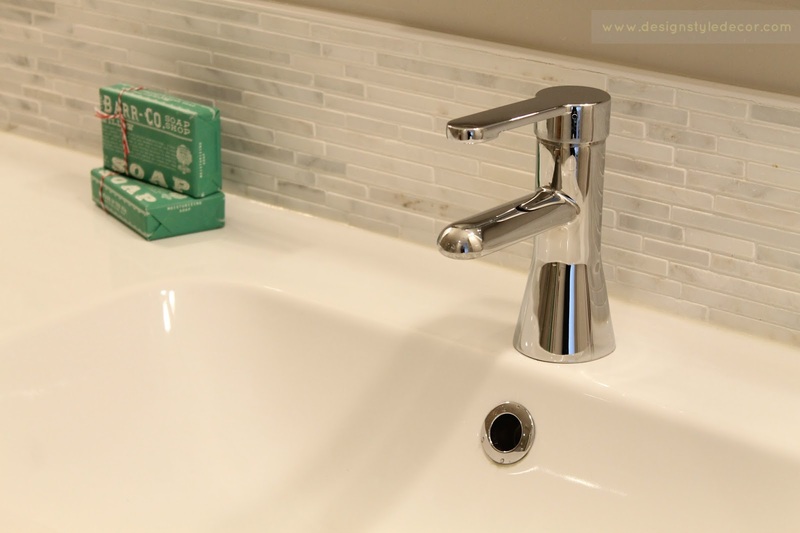 I am so bumped to give these Ikea RÖRSKÄR faucets such low rating as the faucets are in fact performing beautifully and are looking just great. The reason for lowered rating is that chrome that this faucet is plated with is coming off the strainer leaving it with little black spots. It is disappointing to see this happen after just couple of years of use. 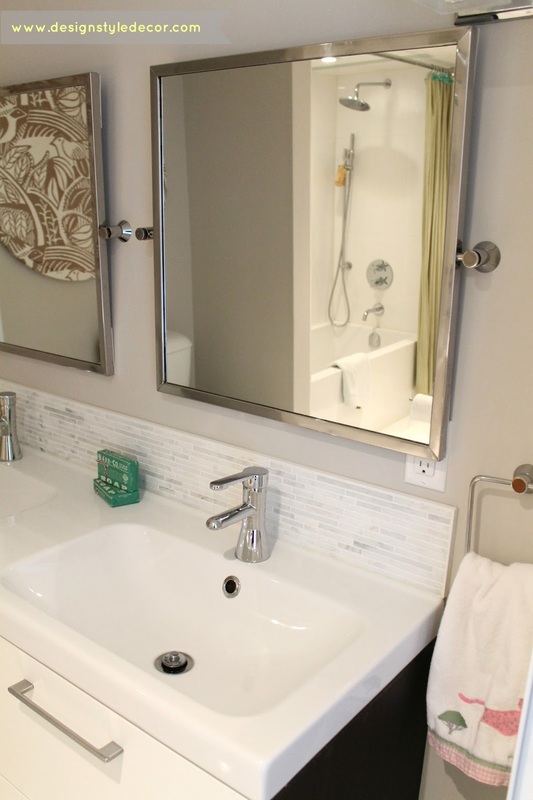 We wanted a deeper soaking tub, decided on acrylic and liked Mirabelle's Edenton tub. Two years later, we still love it. I like that tub is never cold to touch, it is not slippery and apparently scuffs and scratches can be buffed out which I will have to test soon as I found couple of marks probably from falling shower hand. The only slight issue with deeper tub is cleaning of course. We found a toilet with lines resembling the faucets (rounded edges) which was great to repeat in the room. Shape of it seemed fun for kids bathroom so we were sold on it especially as price point was very good - another Rona Uberhaus purchase. What I am not so crazy about is that it sometimes squeaks - must be the plastic seat. The real big fail of the bathroom are Ikea towel bar and towel rings which have since been discontinued. We really loved the rounded square look and how well it worked with rest of the features. The issue is really with sturdiness of the rings which become loose way to easily and can even fall off. I am constantly checking them and I want to have one less thing to worry about. I am thinking of replacing them and I am on the lookout for a better solution. On the other hand - these Ikea swivel mirrors look and work great and we love them. So, overall, I would say that our kids bath, two years in is performing really well. 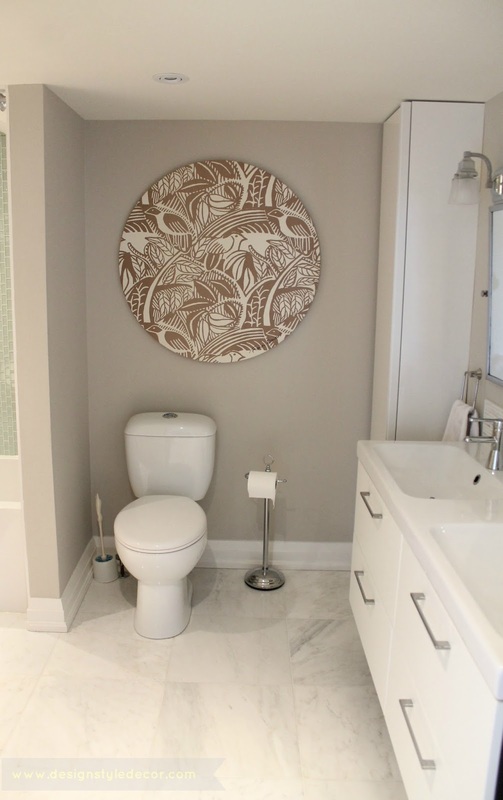 We did not opt to tile all the bathroom walls to save some money and we did not regret it. 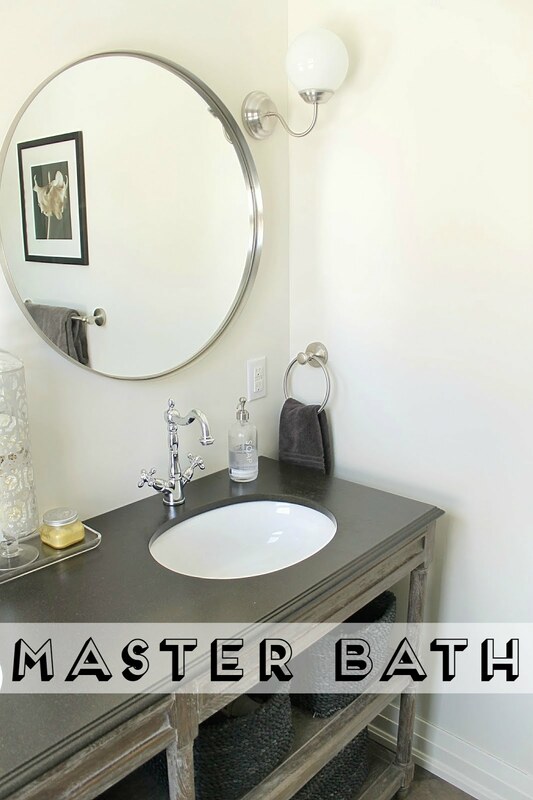 I half expected that walls would have more scuffs and marks on them than they really do and little backsplash that we added to vanity is proving to be just enough. 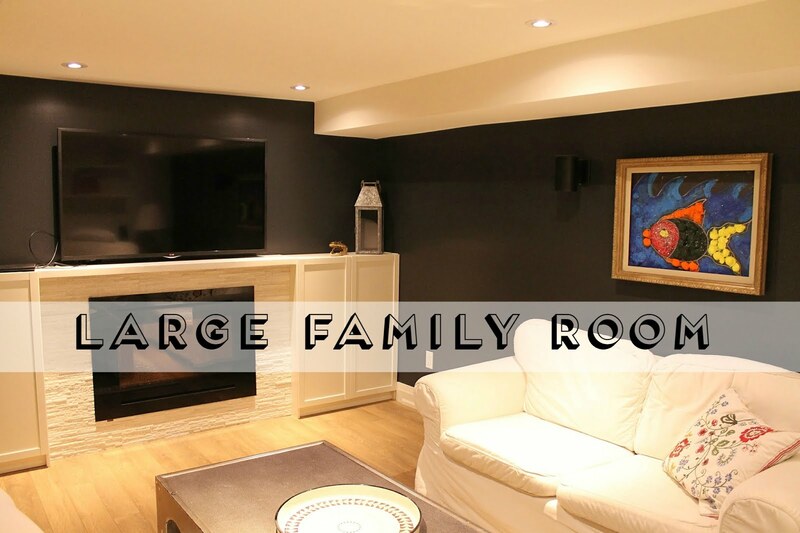 Room is fairly large and L shaped, with length of it being 23 ft and width 12 ft for about half the space and 16 ft for another. First change that we've done to the space since we moved in was to just change the placement of everything. 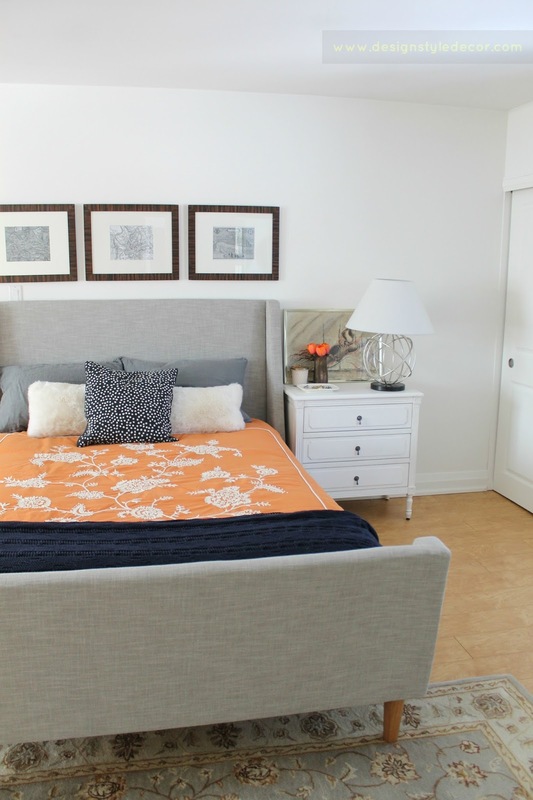 That meant that our bed was positioned on the opposite wall from where the previous homeowners had theirs as it made more sense in terms of focal point. 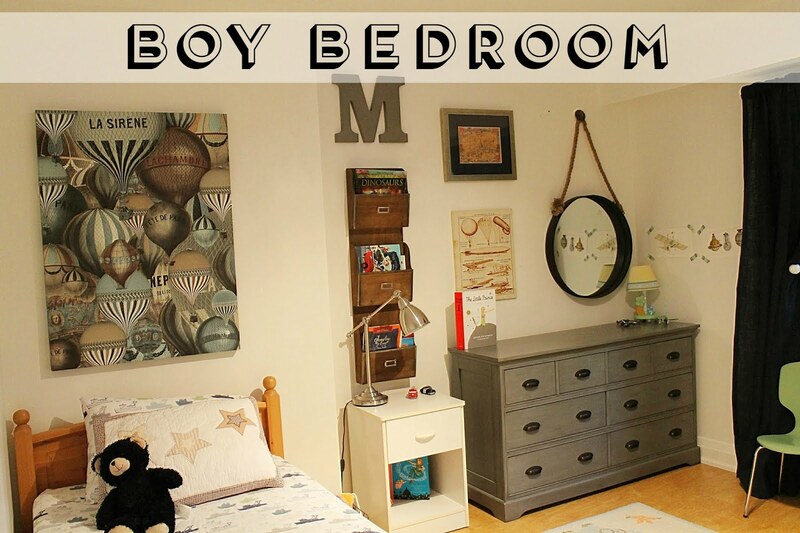 As we were contemplating splitting the room in two to accommodate separate nursery as detailed and designed in earlier post, we wanted to try and envision how it would look with bed in new position so when we got our new sleigh bed, we placed it right across the entrance of the room. In reality, I like this new position as it sets the tone of the room from the first glance. 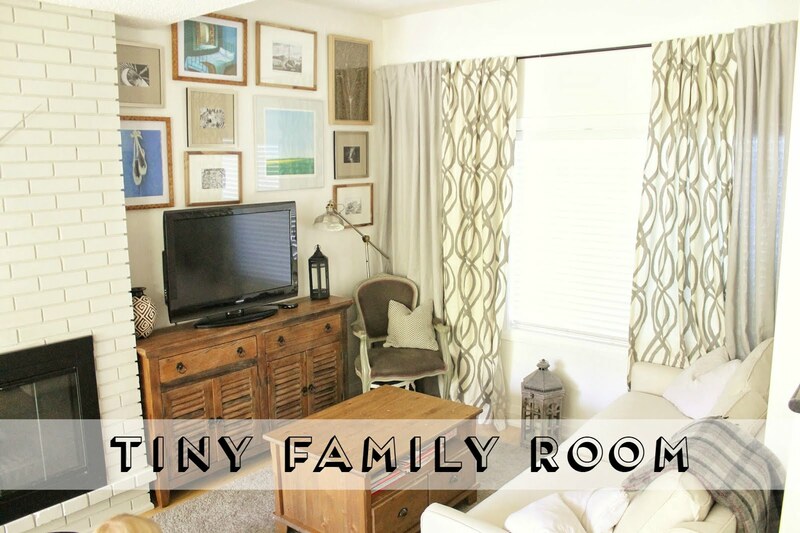 While this new set up would work in overall smaller square footage of the room if we were to build a new partition, we decided not to do it. We really enjoy the room size and both windows, so no.. there will be no partition.. In terms of sleep combinations - we'll have to figure something else out. Duvet cover is the same, some pillows and one nightstand - but after appears so much different. 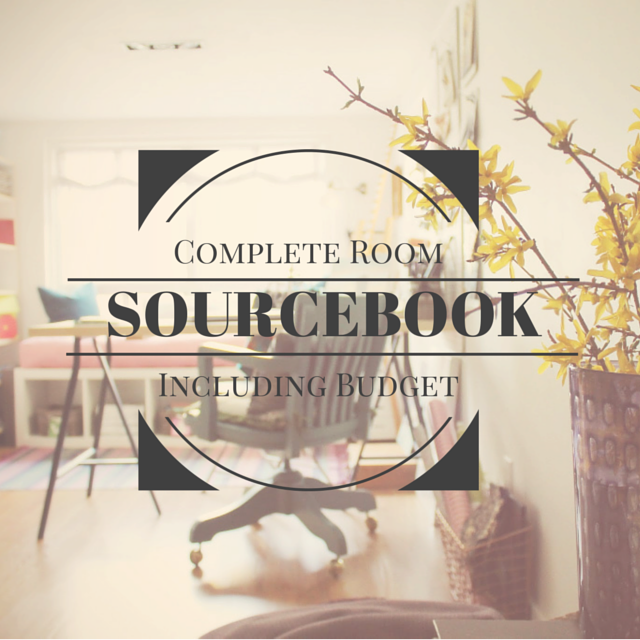 Next up I'll share a different styling and sourcebook. One would think that by the time the baby #4 came I would have everything figured out especially sleeping, but situation is such that I feel like complete novice and I am barely sleeping these 7 months. Interestingly enough, when I talked to a few mommies of 4+ kiddos, it seems that 4th child was special for them as well. My little one never took to using a pacifier and preferred me instead as a human soother which means I am still holding her for most of the night. This leads to sore back, tension headaches, and lack of time and energy for pretty much anything else. All of this is to say that Weekly Roundup this week is rather thin - I only managed a small outing to Halton Hills and Restoration Hardware Outlet and trip to Target where I purchased some frames but not much was photo worthy. At RH Outlet it seems that they are stocking up on merchandise. Additional sale was $25 off every $100 spent, but currently (next three days) it is 30% off. 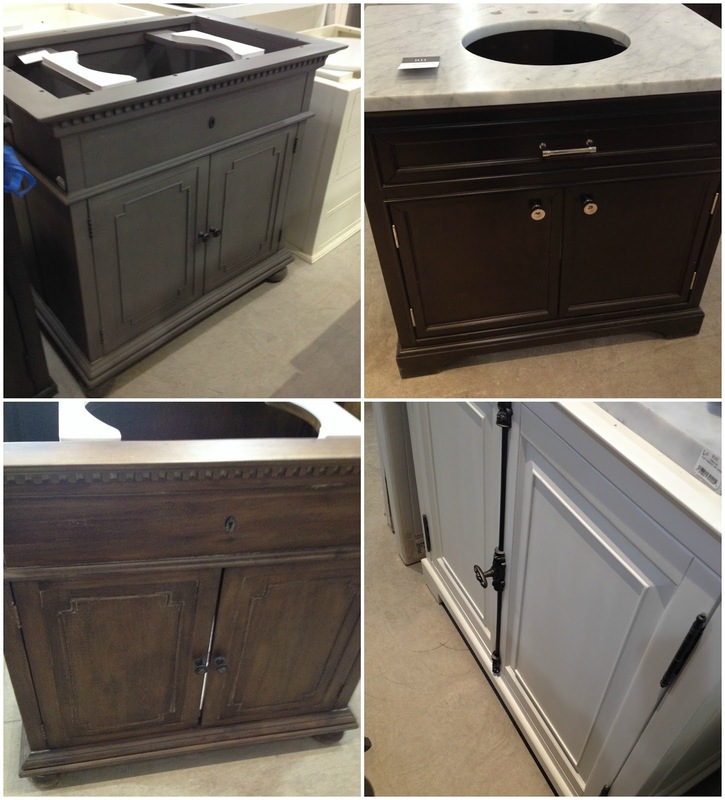 I spied some nice vanities for our powder room reno (when and if it happens). 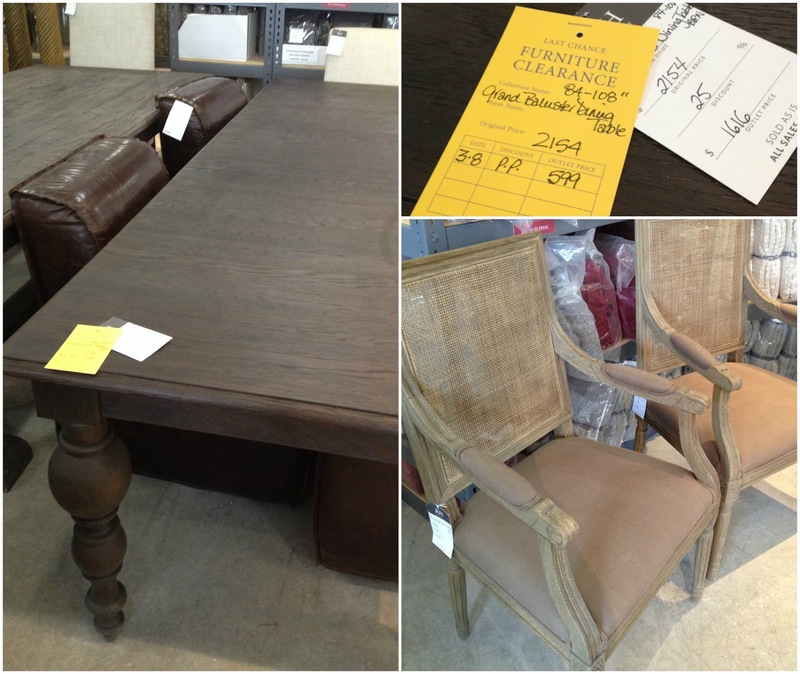 There was incredible deal on this grand banister dining table - $599 on clearance not counting additional discount. 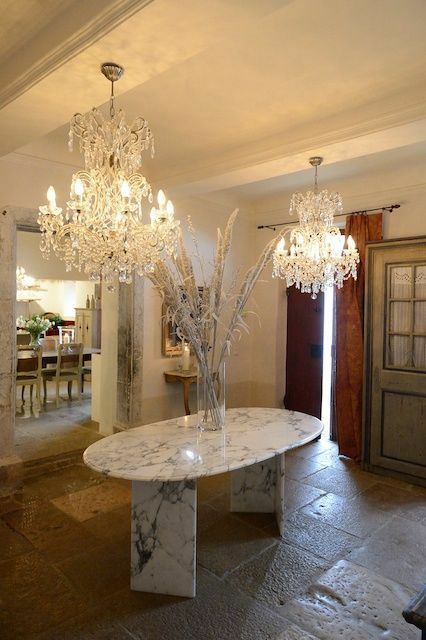 If this table is still available, it would go for $420. Loved these chairs as well. I so wanted to take this rug home - perfection for my son's room, size and color wise but it will have to wait for some other time. 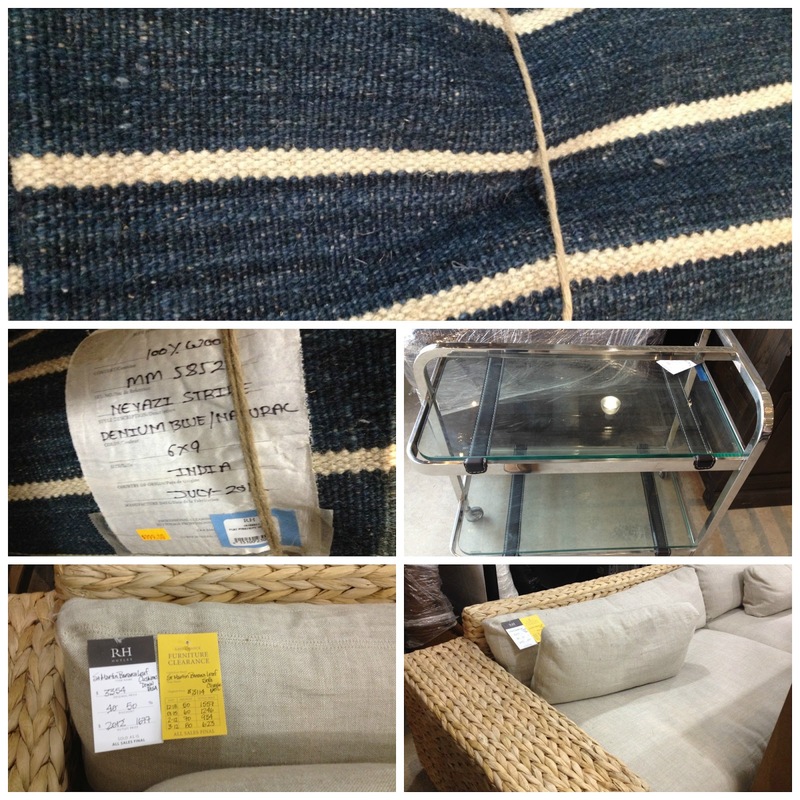 I also loved this bar-cart and this huge sofa was good deal on clearance plus additional discount. I like this fence as I am thinking of adding something similar to our front yard to add some more interest to it. I feel kind of bad for snapping photos outside people's houses - you never know how they might react so I don't take as many as I would love to have. Now that we got double stroller I am hoping to spend even more time stalking our neigbours and to get a few more inspirational images. It is hard to accept and take it all in just how fast the time flies lately. It seems almost unreal that our kids bathroom renovation was completed more than two years ago. 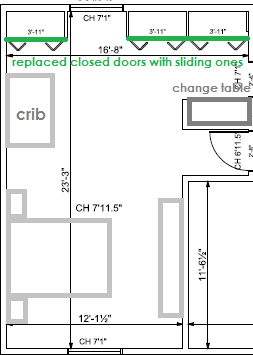 We have a 10-year old girl (going on 15), 7-year old boy (going on 4), very determined little toddler girl and a brand new baby all using this space. So the question is - how is the bathroom enduring two and a half years on? 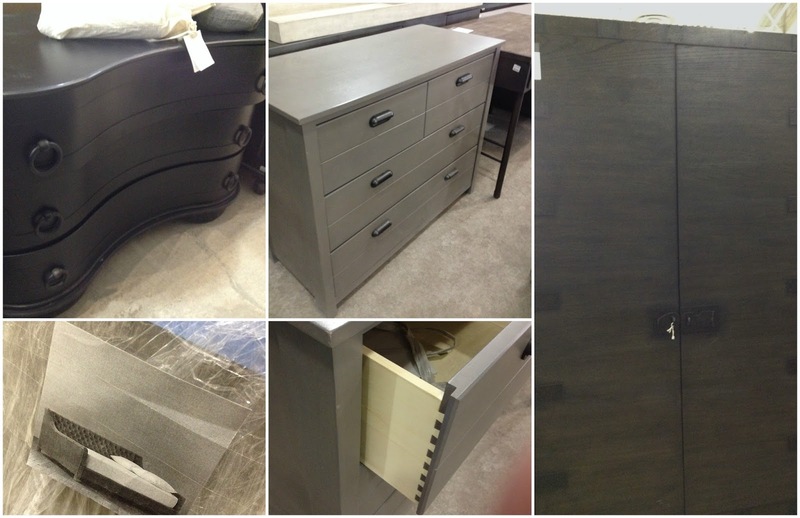 Have we made good practical choices when it comes to fixtures, contractor, storage, tiles and everything in between? 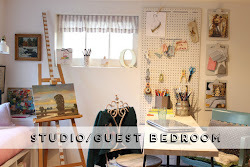 I've shared a number of posts going through our thought and renovation process before we settled on the current design. We lucked out that we had extra space next to original bathroom that we can expand to but that meant re-configuring the layout. 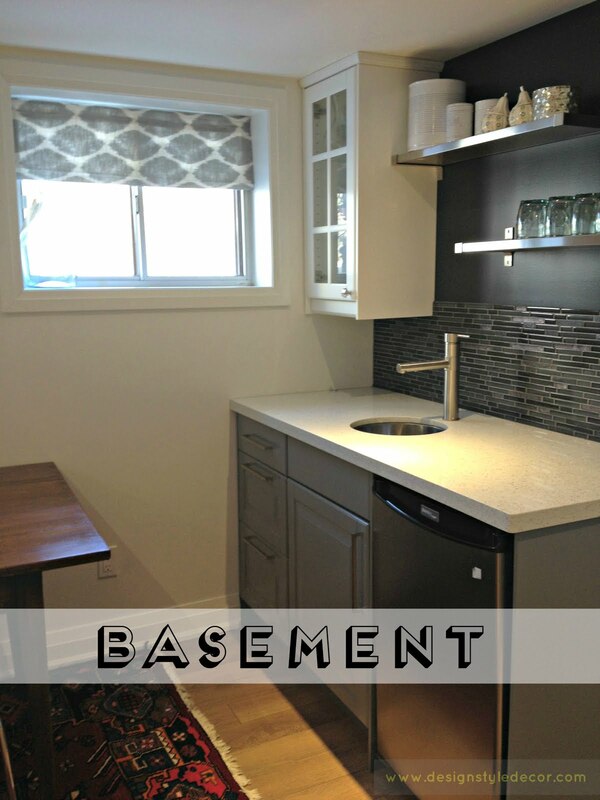 As we started the actual renovation, we made a last minute change of where toilet would be and all in all we couldn't be happier with the choices we made given constraints that we had to work with. When it comes to lighting, less is NOT more and especially in case where there is no natural light coming to the space. During the renovation we added couple of more pot lights than we originally planned including the one in the tub itself. It felt almost as to be an overkill at that point - but now that we are using the space and the light is on separate switches - they were great choices and needed choices. They make the space appear livelier and bath time is pure enjoyment (not counting our toddler's splashing phase). We have 4 pot lights, one of them in the tub and two wall sconces. I've been holding off on this reveal for too long now - as obstacles were just piling up...and I've decided to force it all by purchasing flowers.. well, they almost died so I've mustered a bit of energy, grabbed the camera with low battery (and I cannot find the charger! ), ignored the babies for a second or two, made super fast styling running around the house like a mad woman (not that much different from any other time really) and started shooting without too much regard for light, composition, shutter speed, and all the other fun stuff. The whole 'shoot' took about 10 minutes in total. It's been 4 years now that we visited hill towns of the Luberon region in Provence. 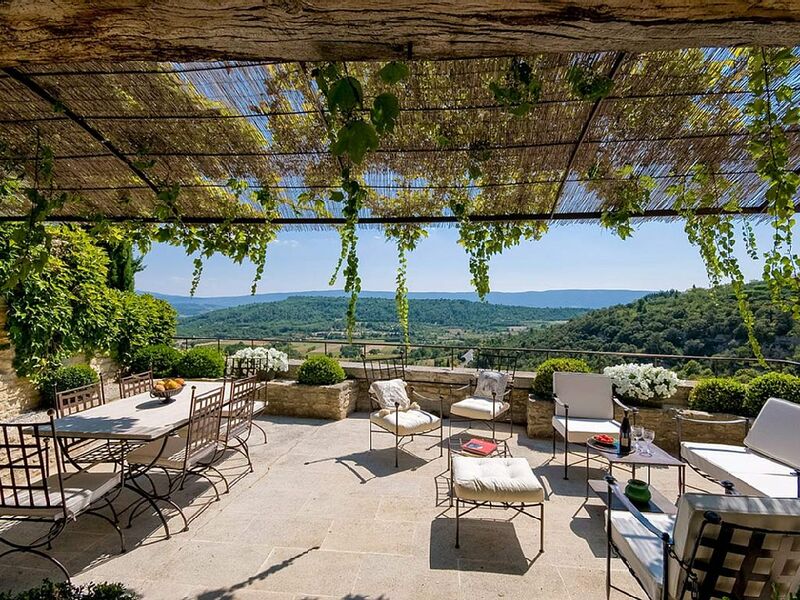 While I will spend some time on our experiences of traveling with kids there in a separate post, I was curious to see what I could find in the short-term rental world if I were to look for a space as a base for the exploration and enjoyment of Provence this summer. I immediately ran into this 18th century country house that perfectly embodies everything that I love about that region. But at not so perfect price tag (about $4000/week) the pictures will have to do. 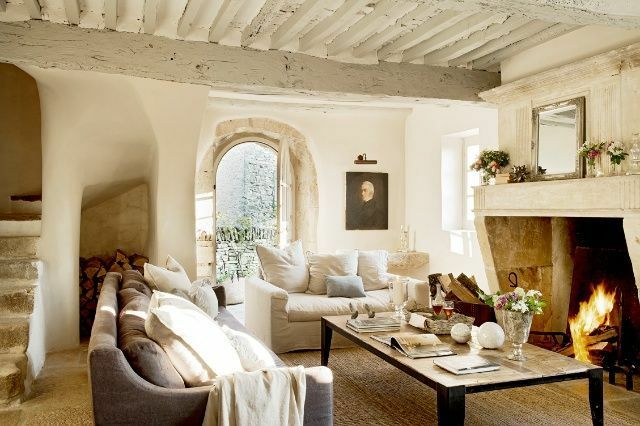 However, as this little country house has 4 bedrooms, it is quite doable to share the space with friends, family, etc making this very reasonable and beautiful vacation. It is March and I am itching to travel, but we are finding ourselves at certain crossroads and uncertainty presently that is making it really hard to plan anything at this point. So I get to travel through beautiful rentals one region at the time. 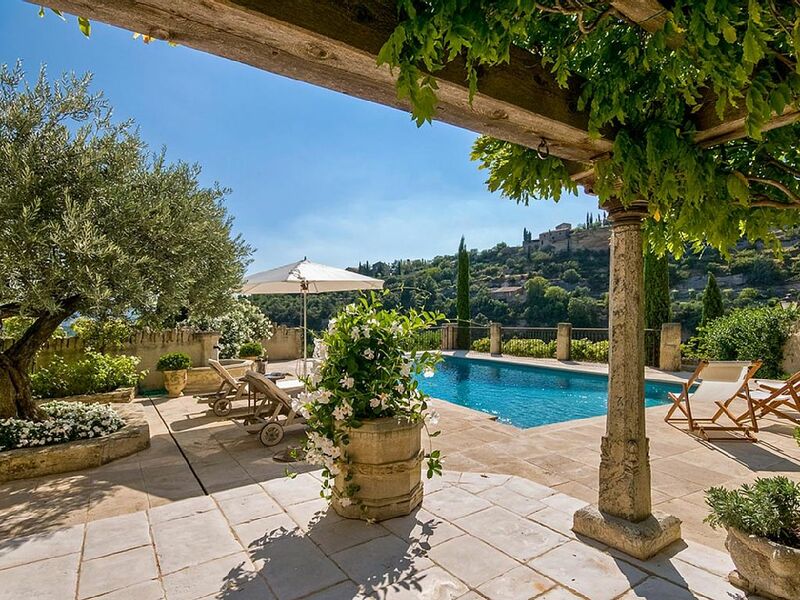 In the heart of a small hamlet of the Luberon, only 5 minutes from Bonnieux, this magnificent 18th century 'Bastide' has been perfectly refurbished and has kept all its authenticity. The property offers 200 sq m of living space (beautiful fitted kitchen-dining room, living room with fireplace, 4 beautiful bedrooms with each en-suite bathrooms). It has been some time now since I last shared some of the e-designs that team MIVI has been working on. 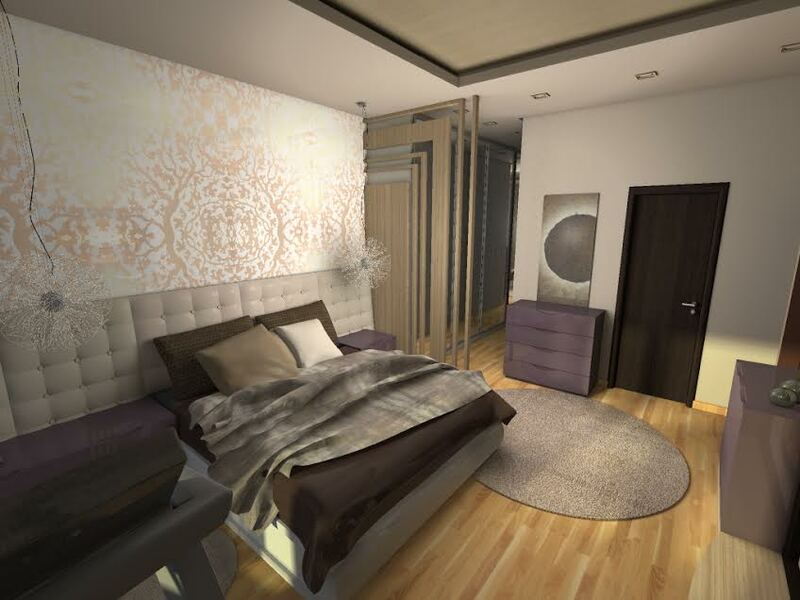 They have been consumed with large project both designing and project managing the work and I am eagerly awaiting the designs and after photos. 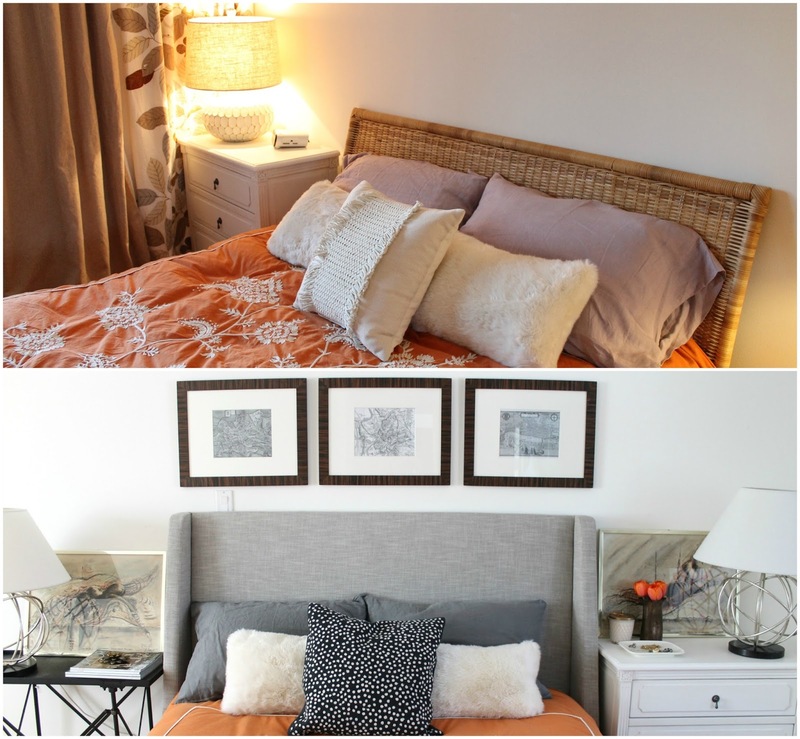 At the moments they've shared bedroom e-designs for two different clients. 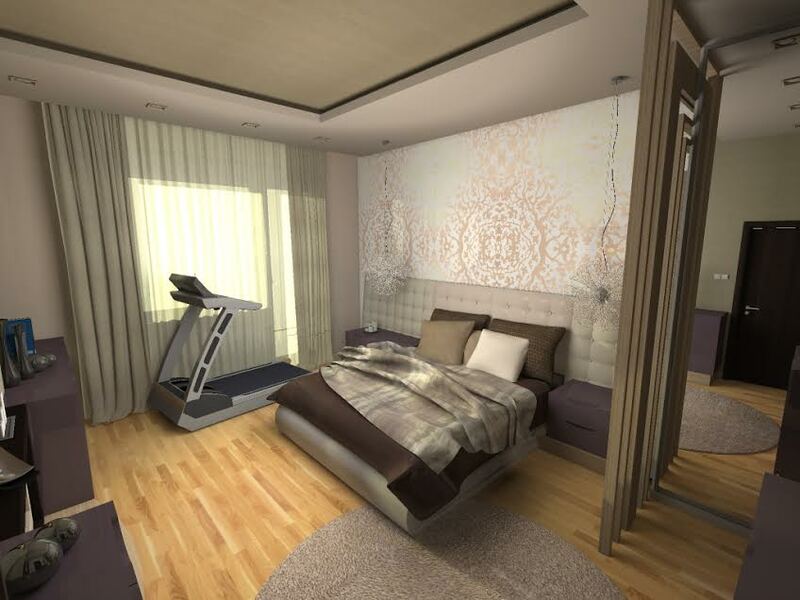 First space has a some interesting design elements, from dipped ceiling, interesting separation wall, floor to top mirror fooling the eye, and of course, treadmill. 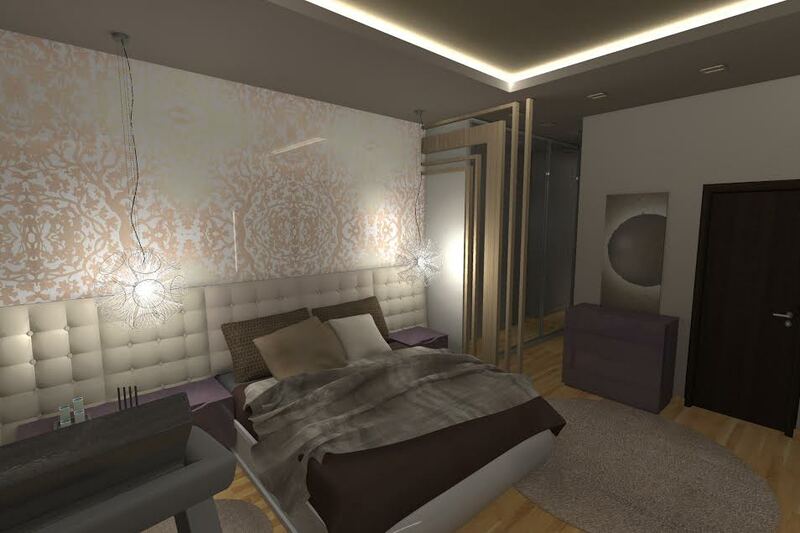 There are layers and layers in this room, from wallpaper, large headboard extending to night stands making the space appear larger, to different heights in ceiling allowing for lighting and additional interest. I really like these pendants and ambiance they create together with ceiling lights. 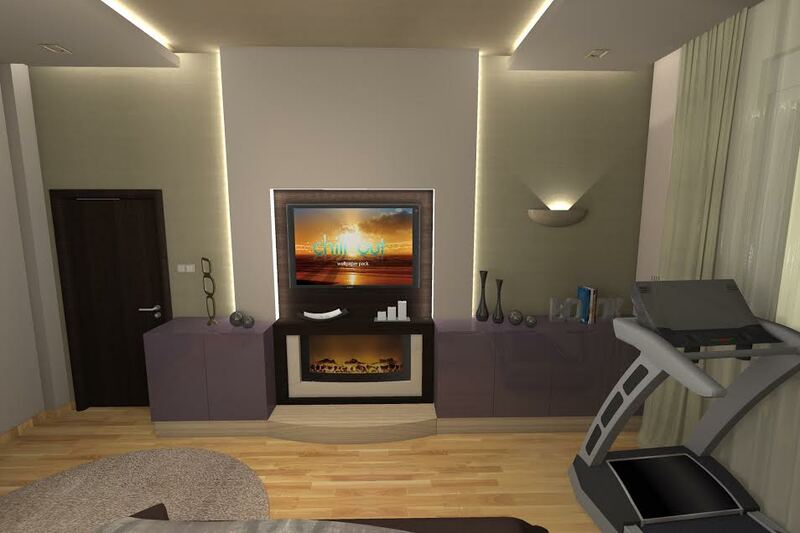 On the other side of the room, TV and fireplace are placed on protruding wall flanked with additional lighting making it all appear as if it is floating. Some 14 years ago or so I've spent some 8 months in Stockholm, more specifically I went there twice each time lasting 4 months as part of my co-op working program. I've immersed myself in the culture as much as I could which was sometimes hard as I detest dill which more than once I had to scrape off the dish. I also took the time to travel in and around Stockholm, enjoy walks, travel further out in Sweden (islands, skiing) and outside (Malmo, Denmark, Belgium). I only regret not traveling more to Norway, Finland and other places so that is now on my list of places to visit. One of the visits I've made that made everlasting impression on me and probably ignited (or just revealed) my love of gardens was to Millesgården. 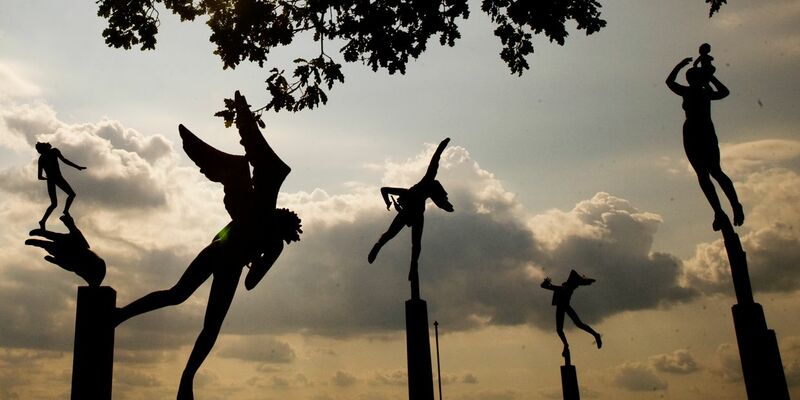 It is an incredible outdoor museum in Lindigö, one of the northern islands in Stockholm. I did not know what to expect as I went there, but I felt completely mesmerized while there and thought about that experience and feeling for days after. I am not sure if I would have felt the same effect if I went now, or if weather played any part of the experience as it was cool and sunny - perhaps it was just the right mix of all the senses being superbly tickled that I felt transported to another dimension or another plane. It was pure enjoyment and I did not want to leave. 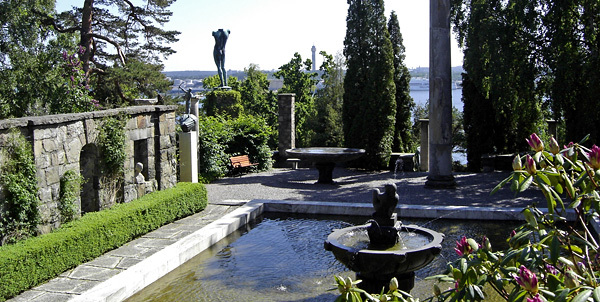 More than anything I saw in the garden, and I only have certain recollections of sculptures without the help of photos, I remember the feeling. I would experience this feeling again in other gardens I've visited from South Carolina to Italy and France, not really 80 gardens around the world, but a few superb ones mixing sculptures, water (ponds, fountains), trees and plants in such a way that they create movement yet relax the eye, with it body and allow for beautiful meditation and enjoyment of life. As I did not have a digital camera back then, my photos are all developed and I grabbed a few photos that I felt were closest to what I saw and experienced back then, but none of them can fully depict the feelings these spaces create. It's been about 7 weeks now that Target announced the closure of all 133 stores in Canada. There have been many articles, opinion pieces, editorials, you name it.. written about it and everyone agrees that Target missed on brand customer expectations, fulfillment and merchandising leading to this news. Basically no one was really surprised and the dust settled fairly quickly. None of that, of course, is any consolation to some 17,000 employees who are mostly working through their 16 week notice period. Just the other day, I saw a person on LinkedIn with the following job title "Looking for work thanks to Target". And that says something - the whole Canadian (mis)adventure appears to be quickly and easily shaken off by the corporation, but it left a very bad taste for the Canadians. It seemed that Target just could not get it right on every turn, from how they started the foraging into Canada to how they are leaving it. The impression it left on me is that they just did not care enough. While I understand the decision on pulling out of Canada from new CEO and shareholders' point of view (the share rose on the news of closures), I cannot agree that closing all 133 was the only option. What probably would have worked and would allowed for some room for growth was scaling down in number of stores and ensuring they become successful. I have really hard time believing that this option was not feasible or that it was only feasible to produce profit by 2021. No, I don't buy it.. It is just easier to write it all off.. When I look at this blog and number of times I've mentioned Target - it comes to 26 posts not counting this one. 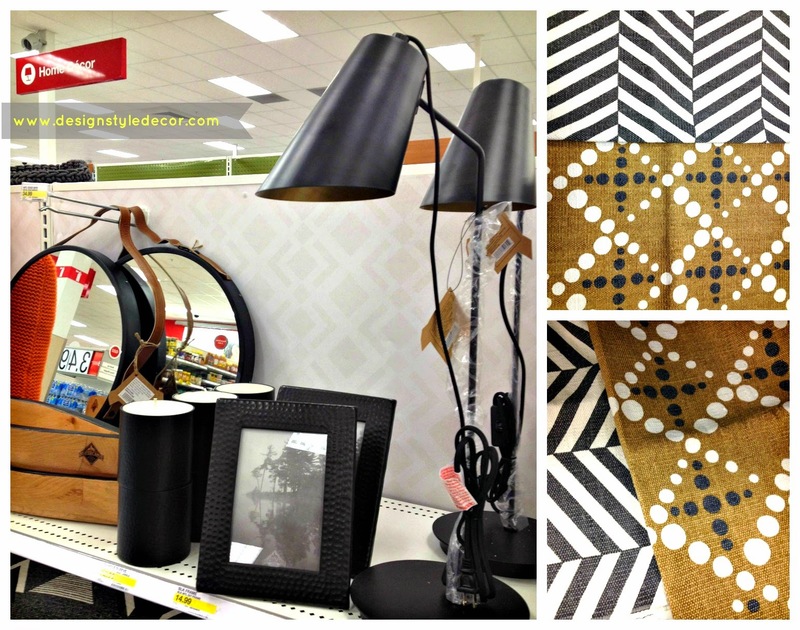 Main reason for mention was either something nice that I found or purchase that I've incorporated into our home decor. I've written also on inconsistent customer service and other little things that drove me crazy in the stores such as carts full of merchandise left in aisles for example making maneuvering impossible, but overall I enjoyed browsing the store far more than I ever did Walmart. I am sure that number of posts mentioning Target will be completely minimized as we are back to coveting what I neighbours to the south take for granted. My other worry is that this unsuccessful venture will deter some other corporations to come to Canada or expand (H&M Home?!).. Bed is in - check! Location of it is a bit new for us, but I like the change. So what is troubling me? First decision that I needed to make was if I should put something above the headboard or not? Big or small? One or more? 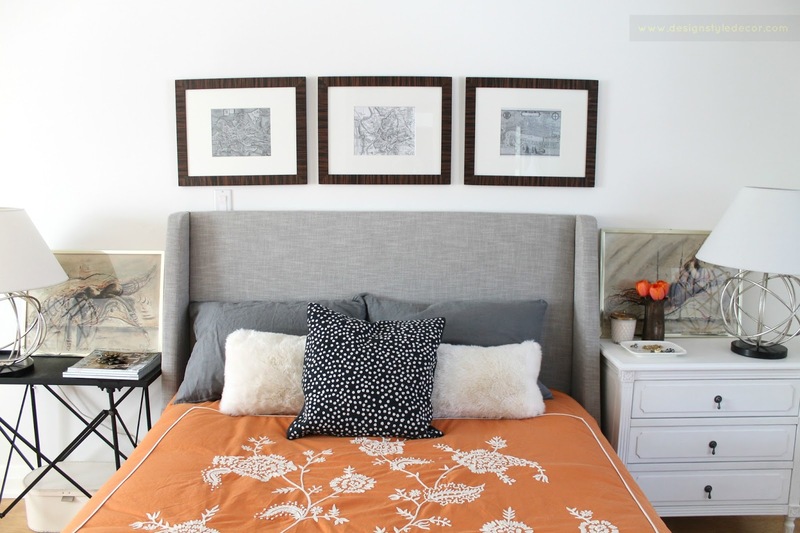 Originally I wanted Moroccan Arch mirrors on both sides of the bed (over nightstands). For over a year or more I've been looking but I haven't found the ones I liked for the price I liked even more, nor was I able to find a different style of mirror that fit that bill. 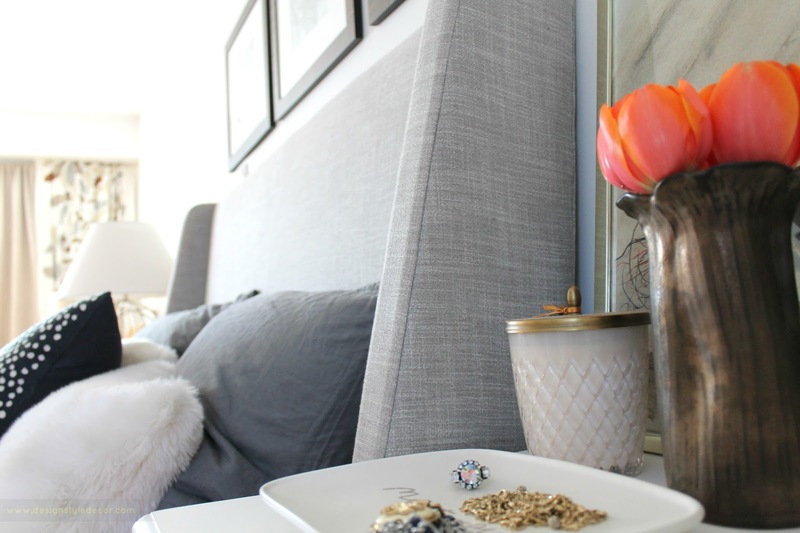 When reading on some of the guidelines when it comes to nightstands I ran into one which says that nightstand height should match the height of the mattress. 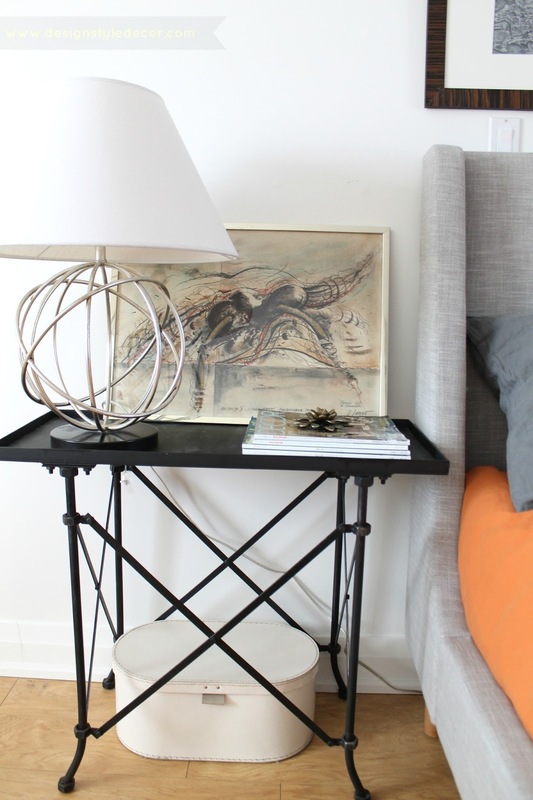 In my case, the side table turned nightstand matches, the actual nightstand does not. 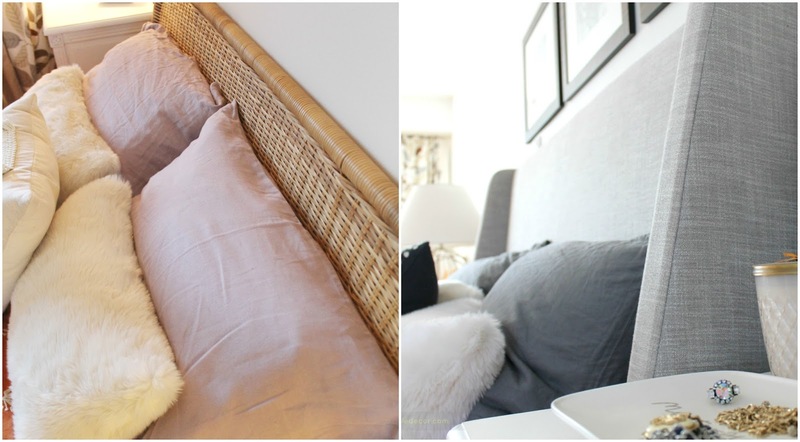 One option is to replace the nightstand and find a different spot for it in the house - the other is to just ignore it. 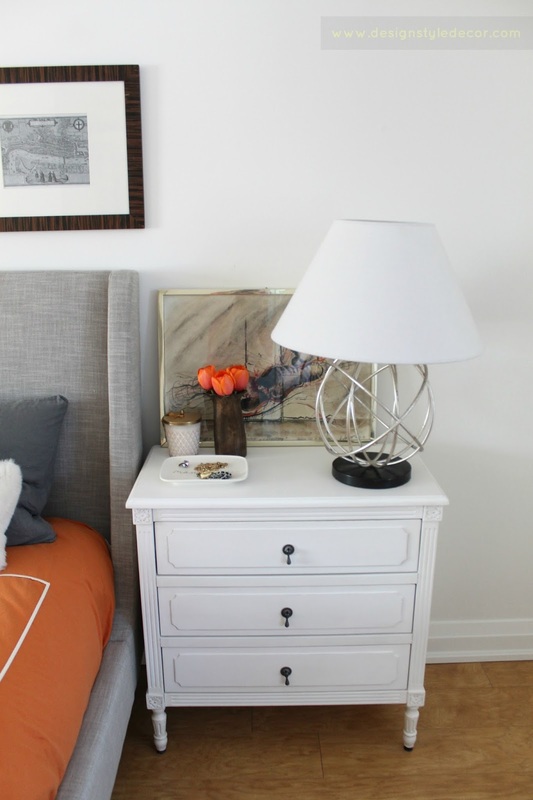 I've looked for images where nightstands are considerably higher than mattress to see how things look and if this would bother me too much. 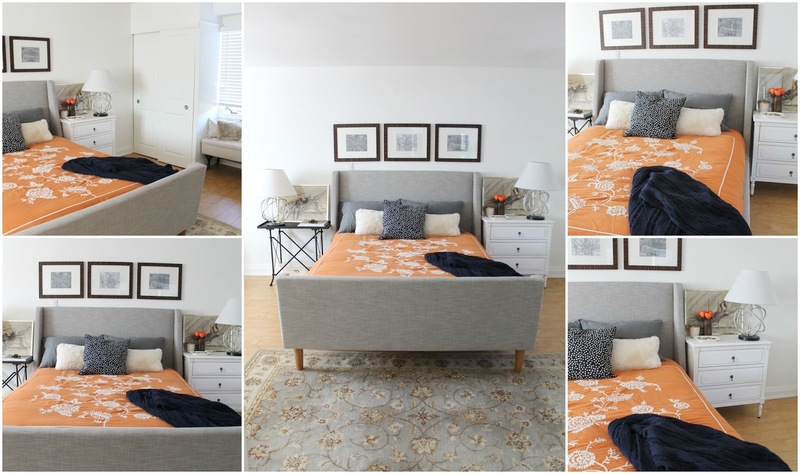 The height of the nightstands is offset in these two photos by strong artwork above the bed and placement of pillows, by stacking the pillows higher, the eye is visually fooled.